Having said that, let me say now that I am vain enough to think that Vridar readers are in some respects like me and share an interest in learning facts about terrorism and suicide bombings (along with any related role of Islam) from investigative journalists and in particular from scholarly researchers who specialize in the relevant fields: anthropology, sociology, political science, Islamist studies among them. To this end my reading list to date consists of Amin Saikal, Ghassan Hage, Jason Burke, Robert Pape, John Esposito, Riaz Hassan, Greg Barton, Scott Atran, Mohammed Hafez, Zaki Chehab, Lily Zubaidah Rahim, Amin Saikal, Tariq Ali and Tom Holland. I am interested in studying the data these researchers gather in support of their conclusions. That’s what these posts have been attempting to do ever since November 2006: to present some sound and verifiable research data and tried and tested explanatory models of human behaviour to counter the pop polemics from public figures (think Sam Harris, Richard Dawkins, Jerry Coyne) who clearly have no more specialist understanding or knowledge of this area than a twelve year old madrassah pupil has about evolutionary biology or neurology. It is also disturbing to learn through some of the rhetoric of critics of these posts (and the writings of Harris, Dawkins and Coyne) how very little they know about the “facts on the ground” and the history of the Middle East. I am dismayed that one such figure, Sam Harris, even publicly ridicules and blatantly misrepresents the findings of one of the most prominent and politically influential anthropologists who has risked his life to learn first-hand, in field research, how terrorists think. In what other area would a public intellectual think to ridicule his intellectual peers while at the same time promoting the popular prejudices and CNN sound-bytes and Fox News stories as reliable and responsible datasets and founts of wisdom? Robert Pape — political scientist responsible for a landmark study of all suicide terrorist attacks from 1980 to 2003. And yes, I’ve also read Sam Harris (two books), Chris Hitchens (four books), Richard Dawkins (six or seven books plus interviews), Daniel Dennett (one book) and even Jerry Coyne (one book and lots of blog posts) and what they have had to pontificate against their perceptions of Islam. For the benefit of newer readers who have been upset by my posts on this theme, note that these posts began in the first month of the creation of this blog. This is not some new-found interest of mine. The by-line of this blog from the beginning has been, Musings on biblical studies, politics, religion, ethics, human nature, tidbits from science. Only this year have some readers seen fit to complain that they do not think that these posts meet Vridar standards of presenting reliable scholarly research and sound argument. I have since had an opportunity to read two more books by Mohammed Hafez: one exploring the phenomenon of suicide attacks in Iraq (up to 2006) and the other Palestinian suicide bombers from 1993 to 2005. See an earlier post of mine in which I outline Hafez’s more detailed explanation of the Quranic justifications used by terrorists. Given that the notions of jihad and martyrdom have been a part of Islam since its inception, why do we find martyrdom to have been only an intermittent phenomenon in Islamic history, and why have suicide bombings only become prevalent in recent decades? This is not to say that religion is unimportant. But there is clearly something more involved. We know that in many cases religion is not even a necessary condition at all; and most adherents of any mainstream religion personally oppose violence. Possibly all the specialist works I have read on the topic point out that there is often a difference between the motivation of the suicide bomber and the organization that decides to recruit him or her and enable them to carry out their hope. If the individual expresses a religious motive, the organization is invariably directed towards a political end. Generally, however, that political motive is also coupled with the religious reason in the individual. The politically oriented organization will appeal to religious sentiments to recruit agents to die and kill. Suicide bombings since 2000 have changed in qualitative ways. Before then [i.e. from 1993], suicide bombings were the domain of Islamic militants belonging to Hamas and Islamic Jihad. In the first half of 2002 the AMB launched the overwhelming majority of suicide missions. Hafez proceeds to explain in detail the way these organizations recruit or accept potential bombers, the qualifications they are looking for, how they prepare them and assign targets. Then in chapter 3 he covers the political and military contexts and explicit strategies of these groups and it is clear that suicide bombing is a calculated strategic response within the context of the armed conflict with Israel. It is by no means a religious crusade for any of these organizations, not even the religious ones. Another enabler is the society that offers approval of these destructive acts. Members of society themselves have no intention of doing anything similar, but many of them nonetheless honour those who become “martyrs”. Their approval is invariably embedded in political conditions. During the Oslo peace process years (1993–2000), most Palestinians rejected suicidal attacks against Israeli civilians. 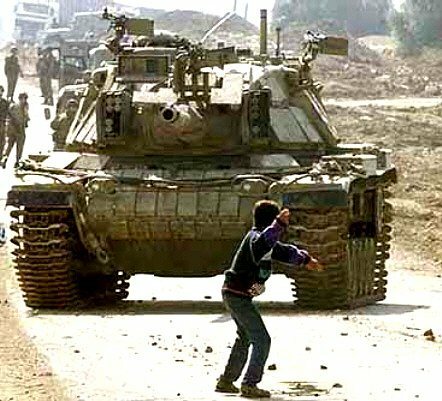 Faris Odeh (1985 – 2000) was a Palestinian boy shot dead by Israeli military forces near the Karni crossing in the Gaza Strip while throwing stones in the second month of the Intifada. A picture [above] was taken by a photojournalist from the Associated Press on October 29, 2000. Ten days later, on November 9, Odeh was again throwing stones at Karni when he was shot in the neck by Israeli troops. Odeh and the now famous image of him have since become symbols of the Palestinian resistance to the occupation. Again, we see that public support is not a constant that we would expect if such attacks could be explained simplistically as anti-semitism or a belief in the duty of Islamic jihad. Individuals who become or intend to become human bombs will also express the different motivations they have as they address different audiences. More recently, and related to understanding the nature of this social support for terrorist groups, witness testimony on 23rd April, 2013 before the Senate Committee on the Judiciary by Al-Muslimi tells us how pro-American Muslim villagers in Yemen who despise both the murderous methods and the religious ideology of Al Qaeda in the Arabian Peninsula were turned into fanatical anti-Americans allowing victory to go to Al Qaeda as a direct result of the impact of a political decision made in Washington [8 page pdf file of Muslimi’s testimony — or watch the video]. Mohammed M. Hafez examines three types of motives underlying suicide terror: organizational, individual and societal. This blog post is examining only the second of these. Hafez will explain the techniques used to link religion to the cause of suicide violence — see Five Ways Hamas and Islamic Jihad Link Self-Sacrifice to Islamic Identity below. Sometimes it appears in dialogue with others on this topic that confidence that one knows exactly and clearly where the fault lies is increased in direct proportion to the extent of one’s refusal to broaden understanding by reference to the relevant research. Mohammed M. Hafez acknowledges that his research does not allow one to know if religion is more important than any other factor as an individual motivator. He defers to other specialist areas to help sort out that question. That’s why I find it illuminating to read widely among such experts. My earliest serious reading into the causes of terrorist violence (Hage) led me to view collective humiliation as the trigger for suicide attacks. But after wider reading I see now that humiliated people do not generally react violently. On the other hand, people who witness the humiliation of others are more likely to seek violent revenge on their behalf. Hafez, a political scientist, understands the need for insights from psychology and other disciplines for a more complete understanding. For Hafez, it is cleat that all three – religion, nationalism and community ties — are important for engendering the culture of martyrdom that underpinned the culture of suicide bombings against Israel. In other works, particularly by Riaz Hassan and Scott Atran, other factors are explored in depth: “altruism” and personal networks. Mohammed Hafez believes it is impossible to understand why there have been significant numbers of Muslims in particular regions like the Palestinian territories accepting of a culture suicide violence unless one first grasps the cultural shift that has characterized Muslim societies since the 1970s. After decades of Western secularization, the Muslim world has witnessed an Islamic revival characterized by the spread of public displays of piety, growing mosque attendance, and the spread of Islamic networks, social movements and political parties. Beginning in the 1970s, young men and women in the universities gravitated toward Islamic social clubs and unions, and Islamic activists reaped the benefits by expanding their representation in local student elections. Where and when allowed, Islamists organized political parties and played an active role in Islamizing their politics. Networks of charity and nongovernmental mosques were created by Islamic activists who saw an opportunity to present viable public spaces free from the “corrupting” influence of the secular state, as well as to foster legitimacy for the Islamic movement through tangible provisions to the public. Another arguable side to this story (not addressed by Hafez) is that the secular movements in the Middle Eastern region aspiring for self-determination and democracy and the removal of Western imposed dictatorships were themselves harried by those dictatorships to the point of virtual extermination. In the place of these broken social and political networks moved the Muslim movements. The Palestinian population has also been affected by this Islamic revival so that “significant segments of Palestinians living in the West Bank and Gaza have become more religious as a result”. Since the 1980s Palestine has witnessed the rise of Hamas as a legitimate political institution and a mushrooming of Muslim charities and Islamic groups on university campuses. The old days of secular nationalism, socialism and Nasserism are gone. Now the religious narrative to explain the many crises facing the Muslim world have attained legitimacy among the wider public. First, Hamas and Islamic Jihad insist that jihad in Palestine is an individual obligation as opposed to a collective obligation. Islamic scholars who are willing to argue this line are promoted by these groups. Second, proof-texts from the Quran and prophetic tradition calling for jihad and martyrdom are promoted in all communiqués from Hamas and Islamic Jihad. Third, Hamas and Islamic Jihad draw upon Prophet Muhammed’s narrative of faith and persecution. The Muslim narrative claims that it was Muhammed’s courageous endurance of persecution for twelve years, and his subsequent decade, while dispossessed of his home, of fighting back with seemingly insignificant numbers against overwhelming foes, that gave birth to Islam. Without such faith and courage Islam would never have been born. The narrative teaches that it is God who fights for them. The power on their side is greater than the forces of tanks and air-planes. Fourth, Hamas and Islamic Jihad relabel suicide with the euphemism “martyrdom operations”. Suicide is considered shameful, a form of social deviance and a sign of a weak mind. Martyrdom, on the other hand, is noble, courageous, honorable. Fifth, organizers of suicidal violence use ritual and ceremony to amplify the value of martyrdom in society. Ritual is symbolic behavior and prescribed procedure that is dramatic, socially standardized, and repetitive. It aims at arousing emotions, deepening commitments, and incubating the values of collective ethos. It links individuals with broader goals and identities and may even link worldly time with sacred history. Ceremony is a formal, public ritual to commemorate a special event, celebrate human accomplishments, and honor solemn occasions with reverence. Setting apart an occasion or persons for special recognition implies social acceptance and veneration of one’s action, position, or identity. Ceremony is intended as much for those observing the honor as for those honored. It is society’s stamp of approval, one way of setting standards for action. Hence the posters, web-sites, public exhibits honouring the “martyrs” and publicizing their heroic sacrifice. Suicide bombers understandably frame their last wills and testaments in religious ideas. These statements contain at least three themes. “Martyrdom operations” are necessary to fulfill one’s commitment to God and Muhammed who urged Muslims to fight persecution and not fear death. This is found even in those who acted for the non-religious organization, the al-Aqsa Martyrs Brigades. Martyrdom is a redemptive act. To be chosen for a martyrdom operation is considered as a stamp of approval among one’s peers. It is seen as an endorsement of one’s moral character and dedication. The mother of another suicide bomber told how her son, on the day of his death, had asked her repeatedly to pray for him so that he would be successful in his coming test. She thought he had meant a school exam. Not only is it an individual redemption, but it is further understood as an attempt to redeem society of its failure to act righteously. (I am reminded of the blood of the Maccabean martyrs was believed by some Jewish sects to have an atoning value for the entire Jewish community.) Accordingly some martyrs in their final testimonies urge their family members to be devout Muslims, to fulfill their religious and family obligations to God and one another. The third theme is the promise of reward in the after-life. O father and mother, dearest in my heart; o brothers, sisters, and friends, life near God is the best of lives and better than life itself, especially one dominated by arrogant tyrants. Many in their testaments ask their parents for forgiveness for their past sins and assure them that by preceding them to heaven through martyrdom they will have the right to assure those for whom they intercede — their parents — that they will be given an honoured place in heaven. For the same reason suicide bombers urge their families to celebrate and not mourn their deaths. The individual motives of suicide bombers are mixed; they are complex. Hafez is clear: it would be a mistake to blame religion as “the motivator”. Bombers directed by the secular groups AMB and the PLFP express religious values and those enlisted by the religious Hamas and Islamic Jihad express nationalistic goals and a desire for defiance and revenge against Israel. A desire to shake Palestinians in particular, as well as Muslims and Arabs generally, into action by their act of heroism. This is another form of redemption. A nationalist redemption. How beautiful for the splinters of my bones to be the response that blows up enemy, not for the love of killing, but so we can live as other people. . . We die so that future generations may live. It’s amazing that man sacrifices himself so as to enable his nation to live. The hope is that their act will help awaken the consciousness of Arab peoples to collectively pressure their governments to act against Israel and her allies. I ask God almighty that my martyrdom is a message to all the Arab and Muslim nations to get rid of the injustice of their rulers that weigh heavily on their shoulders, and to rise to bring victory to Muslims in Jerusalem and Palestine, and in all conquered Muslim lands. Why are you committed to this transient world? Why the fear? We only die once, so let it be for the sake of God. I am going to fight instead of the sleeping Arab armies who are watching Palestinian girls fight alone. Nationalism, Hafez rightly point out, is about “imagined community” or “fictive kin” and not just shared borders, language and culture. I find it surprising to find Westerners scratching their heads when they hear of Muslims speaking of liberating their conquered lands when they cannot see any direct relationship between the nationality or ethnicity of that Muslim and any actual “conquered lands”. Surely Western education can do better than this and we can understand even from our own Western histories how even political nations were forged out of myths that created bonding identities among peoples who would never meet. Just as all Americans and even much of humanity grieved over 9/11, even though most never lost or even knew anyone involved, so Israel’s response to Palestinian violence has generated additional grievances, humiliations and traumas that have generated desires among ordinary Palestinians to avenge loved ones and unknown others they identify with. Closures, curfews, checkpoints, home demolitions, targeted assassinations, military incursions, and the security barrier/wall of separation had a dual effect of building bonds of solidarity among communities and increasing the desire for defiance and vengeance. All of the families the Guardian interviewed described how the suicide bombers would rage at the images of the Palestinian uprising, breaking down in tears or shouting before their television sets. Perhaps one of the better-known stories is that of the twenty-seven year-old apprentice lawyer Hanadi Jaradat, one of the female suicide bombers of Islamic Jihad. On October 4, 2003, she blew herself up in the Maxim restaurant in the Israeli seaside town of Haifa, killing 21 Israelis and injuring 60. Like Hiba Daraghmeh before her, she, too, appeared to her family to be happy the day before the attack. There can be little doubt about what motivated her action. The reaction of her family reflects how community ties could lay the basis for societal support for suicide attacks, a theme that will be taken up in the next section. I didn’t decide in one moment [to carry out an attack]. I had been thinking about it from the beginning of the Intifada, looking for an opportunity and an organization to help me do it. There were few factors affecting the decision-the stress of the occupation, the humiliation of my cousin being searched by soldiers, the killings … against kids — and the action was in honor of the kids who were killed. I did this because of the suffering of the Palestinian people. The falling of shuhada [those martyred by Israeli forces] … and the destruction everywhere in Palestine … I did this for God and for the Palestinian people. I didn’t think about the consequences of the operation — if it would make things better or not. I don’t understand politics … but that we are able to react against their bombings and their killing of inhabitants of the camp is important. My mission made them [in the camp] happy, even though they were punished a lot [for it] in Jenin. The land and trees and houses were punished; nothing remains that they did not punish. I believe the operation would hurt the enemy. .. Also [a] successful mission greatly influences society. It raises the morale of the people; they are happy, they feel strong. I know the bombing will hurt the Israelis and prove to them that we are still ready to fight. [So much] happened to our camp because of the destruction — someone told me the operation would be a benefit to the camp, to create pressure on the Israelis in order that they retreat from the territory…. The most important thing was that we should make an operation in the heart of Israel after the [Israeli military] penetration in order to prove that we were not influenced by the military attack. All these statements reflect the underlying sense of moral righteousness derived from the act of self-sacrifice. They also show that one cannot simply disaggregate nationalism and religious revivalism; the suicide bombers are dying for God and country. Religious revivalism, nationalist conflict, and community ties underpin the culture of martyrdom that emerged during the second Palestinian uprising. Organizations drew on these three sources of identity to engender the myth of the heroic martyr. These identities were interwoven by militant groups to frame martyrdom as an act of redemption, empowerment, and defiance against unjust authorities. Volunteers for suicide attacks are not brainwashed victims of opportunistic organizations, nor are they manipulated individuals who are fooled by calculating terrorists. Instead, it is more appropriate to say that they are inspired by the opportunity to fulfill their obligation to God, sacrifice for the nation, and avenge a grieving people. These motivations are not the same as the strategic calculations of the organizers of suicide attacks. That remaining question is the subject of his next chapter. Posted on 2013-06-23 11:32:51 GMT+0000 by Neil Godfrey. 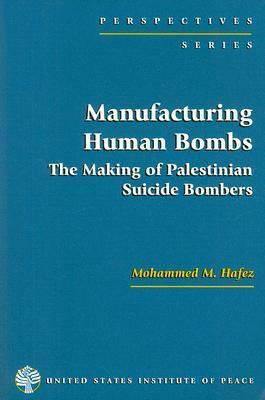 This entry was posted in Israel-Palestine, Terrorism and tagged Hafez: Manufacturing Human Bombs, Mohammed Hafez, Terrorism. Bookmark the permalink. What writings of Tariq Ali apply to this subject? From what I see of reviews Stern’s findings are consistent with the other works I have read. Religion is used to legitimize violence, to rationalize it, and is manipulated by terrorist organizations whose agendas are political. One reviewer notes that her conclusion is that the most effective way to combat terrorism is through psychological warfare and not violence, the latter course only creating conditions that fan such terrorism. Psychological warfare is the essence of the way certain Indonesian and European authorities are now going, and that even the U.S. is attempting in Afghanistan (albeit in conjunction with violence — so there’s a contradiction there), and that the favourite target of Sam Harris, Scott Atran, also endorses. Probably the most effective means of putting a stop to suicide terror overnight is for news media to stop giving it publicity. The whole point of these acts is to generate widespread fear and public reactions and publicity for the organization behind it. Later today I may add a few excerpts from other reviews of Stern’s book to this comment. Thanks for bringing it to notice here. Conducting interviews with ‘holy warriors’, from Protestant militias in Arkansas and Jewish millennialists in Jerusalem to Islamic militants in Pakistan and Afghanistan . . . .
. . . empathy for the interview subjects, necessary to explaining motives, does not translate into sympathy for their atrocities. . . The first part of the book examines religious terrorism from the individual perspective, exploring the reasons for joining terrorist groups. Stern presents a list of grievances that provide a basis for recruitment. Once recruited, the willingness to commit violent acts is explained, in part, through the mechanism of ‘doubling’ in which terrorist recruits lose the ability to empathize with the victim. The cases are as varied as are the missions, but the reader is struck by the similarities as much as the differences among militant religious groups. . . . The double reference to empathy here reminds me of people who appear not only incapable but unwilling to even try to understand the motives of terrorists, preferring to opt for simplistic dumping on religion or a particular religion per se as the cause. She has interviewed extreme Christian fundamentalists in Arkansas, violent anti-abortionists in Washington DC, militant Jews who dream of blowing up the Dome of the Rock in Jerusalem, and, inevitably, ‘jihadi’ Muslims in Gaza, Kashmir, Indonesia and elsewhere. Her book provides a rich, scary and thought-provoking picture of the world and worldview of the religious zealot. . . . . There are harrowing, surreal conversations with murderers and fanatics. But often what startles her (and us) is the ordinariness of the people she meets. They live in neat houses and their wives bake cakes. Almost invariably, they are welcoming and courteous. . . . . The two overarching questions the book tries to answer are what drives these people, and how they organize themselves. Jessica Stern sees religiously inspired terrorism as, first and foremost, a response to humiliation. The ex-convict in a Texas trailer park, the angry young man in a refugee camp, even the Saudi graduate drawn into the spider’s web of Al-Qaeda-all are likely to see themselves as victims of a state, a world, a system which humiliates them. Violence, legitimated by religion, gives power to the powerless-it ‘dehumiliates’ (here she quotes Mark Juergensmeyer) those who have become deeply humiliated and traumatized. As for organization, there are different types. There is ‘leaderless resistance’: groups which use the Internet to spread their message without having a central base or operational leadership. There are the ‘lone-wolf avengers’. . . . .
Other works will argue that humiliated people do not generally commit acts of violence but many will act violently in response to seeing others humiliated. For four years Stern traveled extensively around the world to interview Christians. Jews, and Muslim extremists who were willing to enact horrendous terrorist acts in the name of God. Her conclusions, unsurprisingly, found that religious extremists, ranging from the Islamic jihadi in Pakistan to suicide bombers in Gaza and the West Bank, have much in common with our own Christian militants, who have committed murder against physicians who performed abortions, and followers of Christian Identity, the church of the white supremacist Aryan Nation, which spawned Timothy McVeigh. . . . The author concludes that the West must counter the slogans and indoctrination used by terrorists to mobilize recruits, so as to remove the obstacles that allow our enemies to propagandize against us. Her suggestions include that we take public relations and public education as seriously as do the terrorists. She notes that the West is reviled because of our staunch support for Israel in its conflict with the Palestinians, and Stern calls for a more even-handed approach to the confrontation, including denouncing the Jewish state’s settlement policy, which, she contends, is inconsistent with the peace process. . . .
Stern doubts whether the jihadis will win but contends that the victory over terrorism requires that we first get our house in order. She argues that we should change policies that no longer serve our interests or are inconsistent with our values, even if those happen to be policies that the terrorists demand, although we should not delude ourselves into believing that changing our Middle East approach or removing American troops from Saudi Arabia will make al Qaeda or tbe Islamist Palestinian terrorist groups disappear. . . .
Again there a themes here that are common through other literature I have read, notably the “ordinariness” of the people involved, the necessity for public relations and psychological responses, the manipulation by terrorist organizations of the “religious minds”, and the common message that U.S. policy towards Israel and her expansionist settlement program is against U.S. interests. “I saw extremely similar behavior and extremely similar problems in an Islamic insurgency in West Java and a Christian-separatist insurgency in East Timor,” he said. In West Java, elements of the failed Darul Islam insurgency—a local separatist movement with mystical leanings—had resumed fighting as Jemaah Islamiya, whose outlook was Salafist and global. Paraphrasing the American political scientist Roger D. Petersen, he said, “People don’t get pushed into rebellion by their ideology. They get pulled in by their social networks.” He noted that all fifteen Saudi hijackers in the September 11th plot had trouble with their fathers. Although radical ideas prepare the way for disaffected young men to become violent jihadists, the reasons they convert, Kilcullen said, are more mundane and familiar: family, friends, associates. I’d love to have a crystal ball and see what we will learn about human behaviour in future generations — if we are not too busy restructuring our survival strategies in a much warmer and wetter world. We are learning of the relationships between immediate, local members of group of swarming creatures in the animal kingdom — how a fish or fire-fly reacts to the movements of its immediate neighbours and how as a result the entire school or cloud of things moves in harmony as it zig-zags in sudden shifts of direction. If the human mind is more busy with rationalizing what it has initially decided to do or think at the unconscious level, one wonders if our studies of chaos and synchonicity in the world of nature will one day spill over into explaining the course of human affairs. (Maybe then we really will have a “science of history”?) But I could be talking complete crackers. Isn’t it interesting Islamophobes never bring up the IRA? What you are describing is in perfect harmony with what Scott Atran discusses on the basis of his field-work meetings with terrorists. It is what lies behind his “soccer-club” line. Coincidentally, while you were raising the comparison of how we think of the IRA, I was looking at another anthropologist’s observations of the very same point: the IRA is comprehensible to us in terms of our historical narrative; Islamic terrorism isn’t.